The used Chrysler 200 is a mid-size sedan that delivers family-friendly passenger space, high-tech safety gear, and a swift, dependable performance. It’s also one of the rare nameplates in this segment to offer a convertible model. Inside, your used Chrysler 200 delivers high-quality materials and a handsome design. On the road, it combines generous power with modern fuel economy, so you always make the most of what you spend at the pump. The 200 provides world-class safety, putting your mind at ease on the highway. 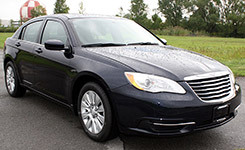 Check out our used Chrysler 200 buying guide to learn more. As you shop for a used Chrysler 200, you’ll find both four-door sedans and two-door convertible models. Both options provide generous head- and legroom and a comfortable trip for the entire family. The front seats create the support you need to make it through your daily commute. For a little extra luxury and refinement, the 200 delivers leather upholstery and sleek styling. In sedan models, the sunroof adds an open, airy vibe. Both the sedan and the convertible supply enough cargo space for your golf clubs and weekend bags. In addition to a handsome, spacious cabin, the used Chrysler 200 is big on tech and convenience features. Because it’s not a very old model, you can expect all the latest infotainment gear. Bluetooth wireless connectivity, for example, makes it easy to stream your favorite podcasts from devices. With the premium audio system, your music playlists have never sounded so good. The central touchscreen provides quick responses to user inputs, so it’s always easy to access the apps you require. Use the navigation system to find your way around previously unexplored territory. Your used Chrysler 200 also provides extensive passenger safety. In fact, the Insurance Institute for Highway Safety named the Chrysler 200 a Top Safety Pick +. In government crash tests, the 200 came away with a perfect five-star rating for overall protection. In newer models, you’ll find an extensive collection of driver aids. These are designed to monitor your surroundings and alert you to potential danger. The forward collision mitigation system, for example, can automatically apply the brakes if it senses an impending collision. Before you back out of your driveway, use the rearview camera to spot any obstacles in your path. Under the hood, used Chrysler 200 models blend substantial power with top-notch fuel economy. No matter where you travel, you can be certain that you’re saving plenty of money on gas. The Chrysler 200 is known for its smooth, quiet performance. Even at highway speeds, you’ll enjoy a serene cabin. This sedan also provides sporty handling, give you the ability to take on winding roads or sharp turns without a second thought.